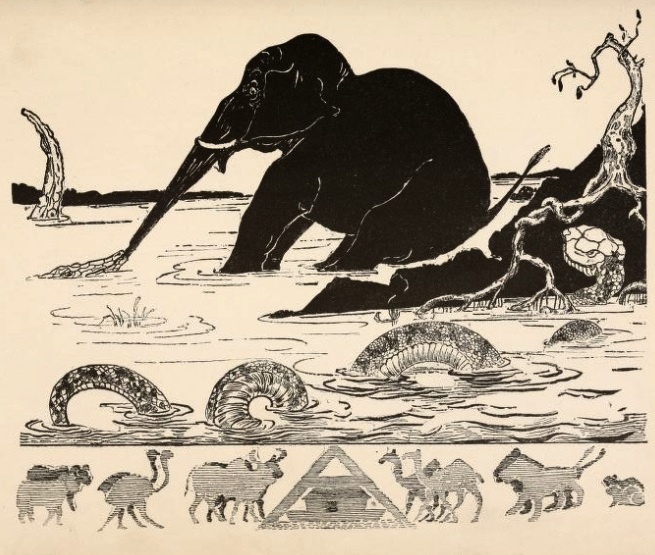 A favorite from Rudyard Kipling's Just So Stories (1902). We hope you enjoy The Elephant's Child. 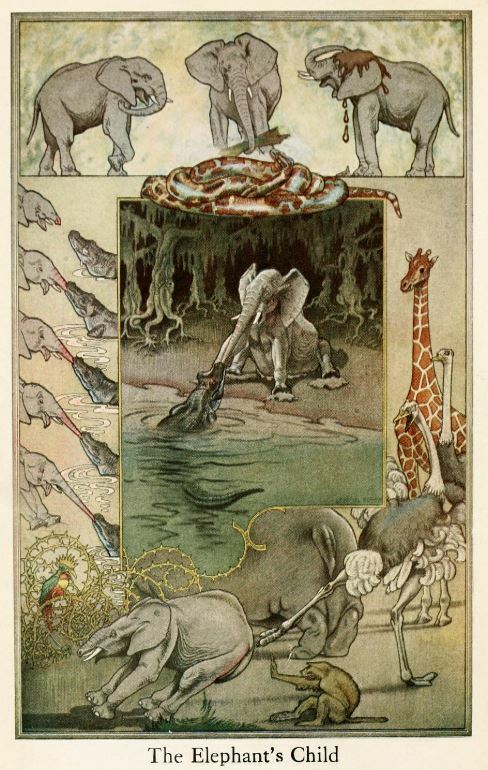 Kipling's anthropomorphic tales are wonderful to share with your favorite children. In the High and Far-Off Times the Elephant, O Best Beloved, had no trunk. He had only a blackish, bulgy nose, as big as a boot, that he could wriggle about from side to side; but he couldn't pick up things with it. But there was one Elephant--a new Elephant--an Elephant's Child--who was full of 'satiable curiosity, and that means he asked ever so many questions. And he lived in Africa, and he filled all Africa with his 'satiable curiosities. He asked his tall aunt, the Ostrich, why her tail-feathers grew just so, and his tall aunt the Ostrich spanked him with her hard, hard, claw. He asked his tall uncle, the Giraffe, what made his skin spotty, and his tall uncle, the Giraffe, spanked him with his hard, hard hoof. And still he was full of 'satiable curtiosity! He asked his broad aunt, the Hippopotamus, why her eyes were red, and his broad aunt, the Hippopotamus, spanked him with her broad, broad hoof; and he asked his hairy uncle, the Baboon, why melons tasted ! just so, and his hairy uncle, the Baboon, spanked him with his hairy, hairy paw. And still he was full of 'satiable curtiosity! He asked questions about everything that he saw, or heard, or felt, or smelt, or touched, and all his uncles and his aunts spanked him. And still he was full of 'satiable curtiosity! One fine morning in the middle of the Precession of the Equinoxes this 'satiable Elephant's Child asked a new fine question that he had never asked before. He asked, "What does the crocodile have for dinner?" Then everybody said, "Hush!" in a loud and dretful tone, and they spanked him immediately and directly, without stopping, for a long time. By and by, when that was finished, he came upon Kolokolo Bird sitting in the middle of a wait-a-bit thornbush, and he said, "My father has spanked me, and my mother has spanked me; all my aunts and uncles have spanked me for my 'satiable curtiosity; and still I want to know what the Crocodile has for dinner!" The Kolokolo Bird said, with a mournful cry, "Go to the banks of the great grey-green, greasy Limpopo River, all set about with fever-trees, and find out." That very next morning, when there was nothing left of the Equinoxes, because the Precession had preceded according to precedent, this 'satiable Elephant's Child took a hundred pounds of bananas (the little short red kind), and a hundred pounds of sugar-cane (the long purple kind), and seventeen melons (the greeny-crackly kind), and said to all his dear families, "Good-bye. I am going to the great grey-green, greasy Limpopo River, all set about with fever-trees, to find out what the Crocodile has for dinner." And they all spanked him once more for luck, though he asked them most politely to stop. "That is odd," said the Elephant's Child, "because my father and mother, and my uncle and my aunt, not to mention my other aunt, the Hippopotamus, and my other uncle, the Baboon, have all spanked me for my 'satiable curtiosity--and I suppose this is the same thing." "'Scuse me," said the Elephant's Child most politely, "but do you happen to have seen a Crocodile in these promiscuous parts?" "Come hither, Little One," said the Crocodile. "Why do you ask such things?" "'Scuse me," said the Elephant's Child most politely, "But my father has spanked me, my mother has spanked me, not to mention my tall aunt, the Ostrich, and my tall uncle, the Giraffe, who can kick ever so hard, as well as my broad aunt, the Hippopotamus, and my hairy uncle, the Baboon, and including the Bi-Coloured-Python-Rock-Snake, with the scalesome, flailsome tail, just up the bank, who spanks harder than any of them; and so, if it's quite all the same to you, I don't want to be spanked any more." Then the Bi-Coloured-Python-Rock-Snake scuffled down from the bank and said, "My young friend, if you do not now, immediately and instantly, pull as hard as ever you can, it is my opinion that your acquaintance in the large-pattern leather ulster" (and by this he meant the Crocodile) "will jerk you into yonder limpid stream before you can say Jack Robinson." And the Elephant's Child's nose kept on stretching; and the Elephant's child spread all his little four legs and pulled, and pulled, and pulled, and his nose kept on stretching; and the Crocodile threshed his tail like an oar, and he pulled, and pulled, and pulled, and at each pull the Elephant's Child's nose grew longer and longer--and it hurt him hijjus!! Then the Elephant's Child felt his legs slipping, and he said through his nose, which was now nearly five feet long, "This is to butch for be!" Then the Bi-Coloured-Python-Rock-Snake came down from the bank, and knotted himself in a double-clove-hitch round the Elephant's Child's hind legs, and said, "Rash and inexperienced traveller, we will now seriously devote ourselves to a little high tension, because if we do not, it is my impression that yonder self-propelling man-of-war with the armour-plated upper deck" (and by this, O Best Beloved, he meant the Crocodile) "will permanently vitiate your future career." So he pulled, and the Elephant's Child pulled, and the Crocodile pulled, but the Elephant's Child and the Bi-Coloured-Python-Rock-Snake pulled hardest; and at last the Crocodile let go of the Elephant's Child's nose with a plop that you could hear all up and down the Limpopo. Then the Elephant's Child sat down most hard and sudden; but first he was careful to say "Thank you" to the Bi-Coloured-Python-Rock-Snake; and next he was kind to his poor pulled nose, and wrapped it all up in cool banana leaves, and hung it in the great grey-green greasy Limpopo to cool. "What are you doing that for?" said the Bi-Coloured-Python-Rock-Snake. "'Scuse me," said the Elephant's Child, "but my nose is badly out of shape, and I am waiting for it to shrink"
The Elephant's Child sat there for three days waiting for his nose to shrink. But it never grew any shorter, and, besides, it made him squint. For, O Best Beloved, you will understand that the Crocodile had pulled it out into a really truly trunk, same as all Elephant's have today. "'Vantage number one!" said the Bi-Coloured-Python-Rock-Snake. "You couldn't have done that with a mere-smear nose. Try and eat a little now." Before he thought what he was doing the Elephant's Child put out his trunk and plucked a large bundle of grass, dusted it clean against his forelegs, and stuffed it into his mouth. "'Vantage number two!" said the Bi-Coloured-Python-Rock-Snake. "You couldn't have done that with a mere-smear nose. Don't you think the sun is very hot here?" "It is," said the Elephant's Child, and before he thought what he was doing he schlooped up a schloop of mud from the banks of the great grey-green, greasy Limpopo, and slapped it on his head, where it made a cool schloopy-sloshy mud-cap all trickly behind his ears. "'Vantage number three!" said the Bi-Coloured-Python-Rock-Snake. "You couldn't have done that with a mere-smear nose. Now how do you feel about being spanked again?" "'Scuse me," said the Elephant's Child, "but I should not like it at all." "How would you like to spank somebody?" said the Bi-Coloured-Python-Rock-Snake. "I should like it very much indeed," said the Elephant's Child. "Well," said the Bi-Coloured-Python-Rock-Snake, "you will find that new nose of yours very useful to spank people with." "Thank you," said the Elephant's child, "I'll remember that; and now I think I'll go home to all my dear families and try." So the Elephant's Child went home across Africa frisking and whisking his trunk. When he wanted fruit to eat he pulled fruit down from a tree, instead of waiting for it to fall as he used to do. When he wanted grass he plucked grass up from the ground, instead of going on his knees as he used to do. When the flies bit him he broke off the branch of a tree and used it as a fly-whisk; and he made himself a new, cool slushy-squshy mud-cap whenever the sun was hot. When he felt lonely walking through Africa he sang to himself down his trunk, and the noise was louder than several brass bands. He went especially out of his way to find a broad Hippopotamus (she was no relation of his), and he spanked her very hard, to make sure that the Bi-Coloured-Python-Rock-Snake had spoken the truth about his new trunk. The rest of the time he picked up the melon rinds that he had dropped on his way to the Limpopo--for he was a Tidy Pachyderm. One dark evening he came back to all his dear families, and he coiled up his trunk and said, "How do you do?" They were very glad to see him, and immediately said, "Come here and be spanked for your 'satiable curtiosity." "Pooh," said the Elephant's Child. "I don't think you people's know anything about spanking; but I do, and I'll show you." "O Bananas!" said they, "Where did you learn that trick, and what have you done to your nose?" "I got a new one from the Crocodile on the banks of the great grey-green, greasy Limpopo River," said the Elephant's Child. "I asked him what he had for dinner, and he gave me this to keep." "It looks very ugly," said his hairy uncle, the Baboon. "It does," said the Elephant's Child. "But it's very useful," and he picked up his hairy uncle, the Baboon, by one hairy leg, and hove him into a hornets' nest. Then that bad Elephant's Child spanked all his dear families for a long time, till they were very warm and greatly astonished. He pulled out his tall Ostrich aunt's tail-feathers; and he caught his tall uncle, the Giraffe, by the hind-leg, and dragged him through a thorn-bush; and he shouted at his broad aunt, the Hippopotamus, and blew bubbles into her ear when she was sleeping in the water after meals; but he never let any one touch the Kolokolo Bird. At last things grew so exciting that his dear families went off one by one in a hurry to the banks of the great grey-green, greasy Limpopo River, all set about with fever-trees, to borrow new noses from the Crocodile. When they came back nobody spanked anybody any more; and ever since that day, O Best Beloved, all the Elephants you will ever see besides all those that you won't, have trunks precisely like the trunk of the 'satiable Elephant's Child. If you liked this story, you might enjoy Kipling's How the Rhinoceros Got His Skin. We offer the whole collection of Just So Stories. Add The Elephant's Child to your own personal library. Return to the Rudyard Kipling Home Page, or . . . Read the next short story; The Enlightenments of Pagett, M.P.